VIA introduces the ARMTiGo A800, a tiny ARM-based system for embedded computing. The device has a fanless, dustproof design and features a 800MHz Freescale ARM Cortex-A8 SoC, 1GB DDR3-800, support for one 2.5" storage device, support for up to Full HD resolutions, HDMI, VGA, four USB 2.0 ports, and Ethernet, audio-in/out/mic-in. The ARMTiGo A800 measures just 120mm x 125mm x 30mm and has an average power consumption of 3.14W. - VIA Technologies, Inc, a leading innovator of power efficient computing platforms, today announced the VIA ARMTiGO A800, the world's smallest ARM system for embedded applications, including hotel automation, digital signage and, surveillance as well as for medical and healthcare applications. Combining an 800MHz Freescale ARM Cortex-A8 SoC with two integrated GPUs, the VIA ARMTiGO A800 delivers robust performance and unbelievable power efficiency, maintaining an average power consumption of a mere 3.14W TDP. With a fanless, ultra-low-profile dustproof design measuring a mere 12.0cm x 12.5cm x 3.0cm (W X D X H), the VIA ARMTiGO A800 can fit easily into any environment, whether it is behind a monitor or on the wall with a 7.5cm x 7.5cm VESA mount or placed alongside other devices. Optimized for both power and performance, the VIA ARMTiGO A800 features an 800MHz Freescale ARM Cortex-A8 SoC which is paired with two integrated GPUs for dual display support and 3D/2D graphics acceleration capable of delivering full HD playback support for resolutions up to 1080p. On-board storage includes 4GB of eMMC Flash which can be expanded through one microSD card connector. The VIA ARMTiGO A800 is available with board support packages (BSP) for Linux 2.6 as well as Android (2.3) OS images. 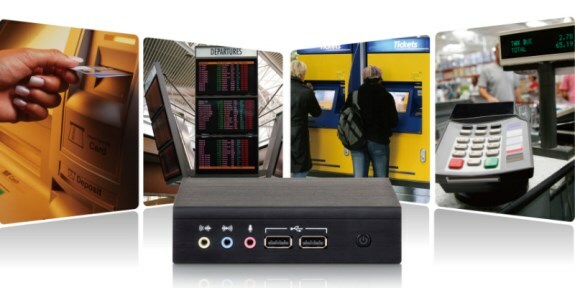 The unique dual-sided I/O coastline interface includes one HDMI and one VGA display port, one 10/100 LAN Ethernet port, four USB 2.0 ports, audio jacks (audio-in/out and mic-in) and 5V DC-in power. An optional VNT9271 WiFi USB module is available which can be supported through one on-board USB pin-header.